On a recent trip to California, my brother and I had the adventure of our lives as we rode a Segway through the streets of San Francisco. 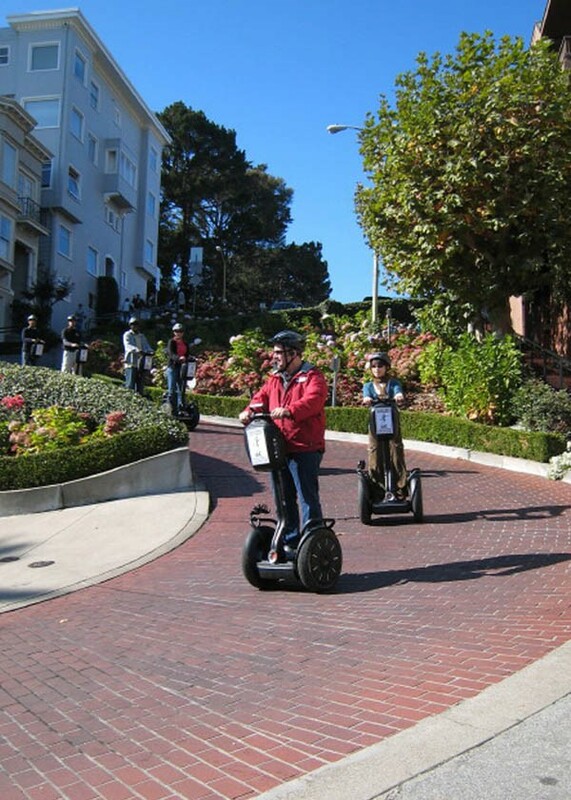 Segway tours are the hip new way to explore cities. They offer a unique mode of transportation that provides intuitive riding and a better vantage point than other touring methods. Plus, Segway tours allow riders to cover much greater distances than traditional walking tours, adding miles of coverage and many more sights. Our tour of choice was San Francisco and Sausalito Electric Tour Company’s “San Francisco Nighttime Tour.” As the name suggests, this was a ninety minute fully narrated nighttime tour of San Francisco. Neither of us had ever been on a Segway, so we didn’t know what to expect. I must admit that I was a little nervous once I learned that we would be riding the Segway on the streets with the traffic and at night no less! I guess I was expecting a leisurely tour along the sidewalks. My fears were eased a bit when we learned that there would be a 45 minute training course included prior to the tour. We met our guide, Steve, and six fellow tour mates at the rear parking lot at 757 Beach Street across the street from the Hyde Street Cable Car turnaround in Fisherman’s Wharf. After viewing a safety video, one by one, Steve fitted us with a safety vest and helmet and then had us step onto the Segways for some instruction. The helmets were outfitted with radio receivers so we could hear Steve’s remarks on local history at various stops. He had us move the Segway forward, then backward and finally around in a circle. 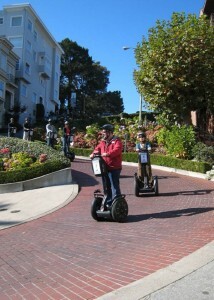 The Segway moves in reaction to body position: to propel the vehicle forward, you simply lean your body forward. To slow down or stop, you lean your weight back, almost as if you were going to sit down. The sensation was a little weird at first, especially when it came to stopping. Every instinct tells you that you are going to fall, however the Segway is designed to keep you balanced. Once everyone was comfortable operating their Segway, Steve set up an obstacle course and had us line up and ride the Segways through the twists and turns of the course. The final task was to propel the Segway to the top speed and then stop as quickly as possible. Once our guide felt that everyone was comfortable riding the Segways, it was time to begin our tour. Our tour began at Fisherman’s Wharf and traveled along the waterfront offering spectacular views of Alcatraz and the twinkling lights of the Bay Bridge. Before long, the tour took a jog to the right and we were faced with our first hill as we made our way toward North Beach. I was just getting the hang of riding the Segway on a flat surface; hills were another story, especially those steep hills that San Francisco is famous for. With my heart racing and after a little encouragement from our guide, I leaned forward and the Segway moved effortlessly up the hill. I was about to breathe a sigh of relief when the traffic light turned red right before we had reached the top of the hill. I immediately had images of rolling down the steep hill backwards! As if sent from Heaven, Steve’s calming voice came over the headset and instructed us to come to a stop at the traffic light and stand upright and the Segway would stay in place. It worked like a charm. We continued on and rode past Saints Peter and Paul Church. This towered neo-Gothic cathedral, consecrated in 1924, anchors Washington Square Park and with it forms the center of the neighborhood. Joe DiMaggio and Marilyn Monroe were famously photographed here after their City Hall wedding. North Beach is that rare thing — a neighborhood that manages to be a perennial hit with tourists, yet also remains beloved by the locals. It’s best known as San Francisco’s Little Italy and is home to some of the liveliest nightclubs and bars in town. We took a short break to stretch our legs and grab a slice of that famous pizza. As we cruised past famous San Francisco landmarks such as Ghirardelli Square, the National Maritime Museum and the historic sailing ships at Hyde Street Pier, Steve entertained us with stories and historical facts. I quickly realized that part of the fun was watching people react to us. Donning a helmet and rolling through the crowded streets of San Francisco on something that resembles a sport-utility scooter gives one a certain prominence. Everywhere we went people would wave or stop to take photos of us. At the end of our tour, our group was unscathed. In fact, everyone wanted to come back for more. For the savvier Segway tour guests, the “Advanced Rider Segway Tour” incorporates more riding, bigger hills and a bit less historical narration. And now the answer to riders’ number one request, “Can you ride down Lombard Street, the crookedest street?” is “yes you can.” Lombard Street is best known for the one-way section on Russian Hill between Hyde and Leavenworth Streets, in which the roadway has eight switchbacks that have earned the street the distinction of being the crookedest street in the world. 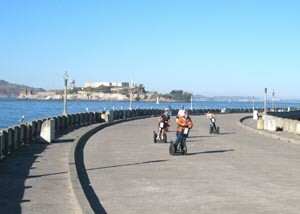 The advanced tour is only available for guests who have already experienced a prior Segway tour. Tours operate seven days a week and are subject to availability and reservations are strongly encouraged to insure that you get the time slot you require. Tour cost is $70.00 per person. To make reservations, please call 415-474-3130 or visit http://www.electrictourcompany.com.